New Easy Instructions and pictures for removing a Mazda Miata MX-5 Radio and replacing it with a new radio. On a day-to-day basis I’m so grateful for the do-it-yourself instructions I can so easily find on the Internet. Most of the time, I find the instructions to be incredibly helpful-especially the instructions that have pictures. It took me less than 40 minutes to remove my old radio and install a new one. I’ve been wanting to install a new radio in my low mileage Mazda Miata MX-5 for a long time. Specifically I wanted a radio that would play books on tape and music from a flash memory drive and an SD memory card. I found a couple of sets of instructions for moving Mazda Miata radios. The instructions were very similar, except I learned a couple of tricks that I think will be helpful to others to take on this project in the future. In the old days and installer would lie on his back under your dashboard and physically cut wires and wire the radio harness into your car’s wearing harness. A much better way to do this is to buy a harness that has male connectors that you can plug right into the harness in your dashboard. The two obvious advantages are that you don’t have to cut any of the the wires in your dashboard, and if you ever decide to put the original radio back in it’s as simple as unplugging the harness and plugging in the original set. I learned that there is a standard wiring color code for car audio which simplifies matching wires from your dashboard to your new radio. The radio wiring harness that I bought had the additional feature that besides being color-coded, it also had written labels on the wires describing which wires were correct for power ground and all the speaker connections. There was especially helpful to a guy like me who is colorblind. After matching up the wires from the back of the new radio to wiring harness wires of the same color, the new radio was ready to install. 1) For your protection and protection to the radio, you should make sure that the power is off to your radio. You’ll have to remove two fuses, the one for the radio, and the fuse that provides the constant power that allows your radio to memorize radio stations and keep time. 2) To remove the Mazda Miata radio, you’ll gently remove two small slim trim peices on the left and on the right that cover two holes on each side. A picture is below. 3) In another picture below you’ll see what your objective is. 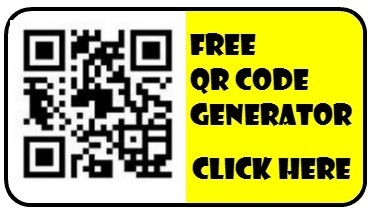 You’re trying to insert a nail or screwdriver or rod into both holes of the radio at the same time, only far enough to depress a tab that will release the locking mechanism for the radio. It’s always easier to understand what you’re trying to do if you can see a picture, so the picture below shows the radio removed with the screwdrivers inserted to show you what the tabs look like when they’re depressed If you have four nails or four screwdrivers, you may want to insert them in all four holes, you need only insert them about an inch and a half. 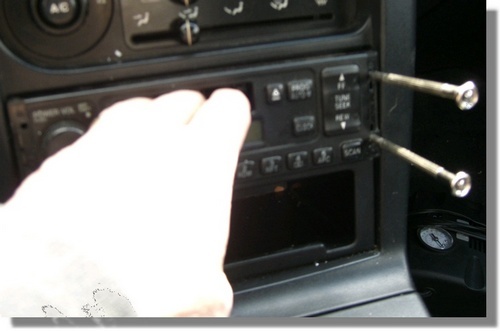 4) My radio had a cassette hole, so once the screwdrivers (or nails) were inserted I placed my fingers in the cassette hole and pulled out the radio. 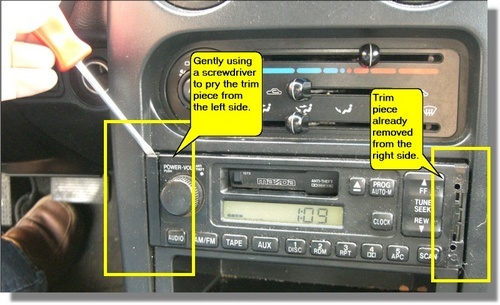 If you don’t have a cassette player, you’ll have to gently improvise how you remove your radio. 5) Most radios have two wiring harnesses from the rear. 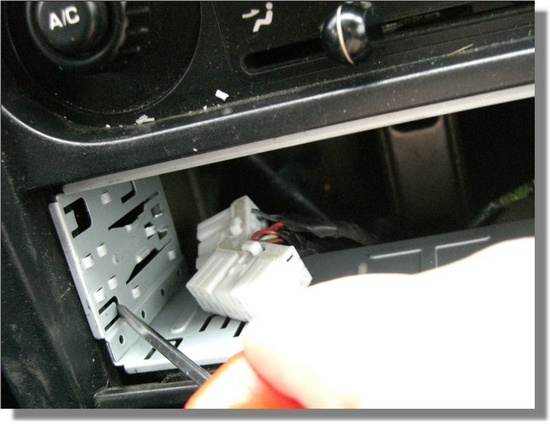 Slowly remove the radio, and as soon as the back of the radio is exposed, look for a small release on the plugs that connecte the wiring attaches to the back of the radio. 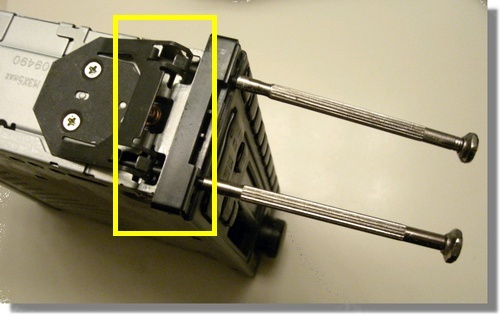 Most radios also have a grounding wire that is held in place with the Philips screw. Remove the grounding wire, also. You can then completely remove the old radio. 6) At this point, you can follow the instructions to install your NEW radio. Generally, you’ll simply install a metal frame in the radio hole in the dashboard, then bend back tabs to hold the frame in place. You’ll plug the new harness into the Miata harness in the dashboard. You’ll reconnect the ground wire post on the back of the radio. The new radio will slide into the frame and click into place like the radio you removed. You’ll need to reinstall the fuses to power the new radio. In another article, I’ll write about the inexpensive radio I chose that allows me to play CDs, play MP3 discs I burn, play audio from SD memory cards, and play audio from inexpensive flash memory sticks. Good luck with your radio installation! 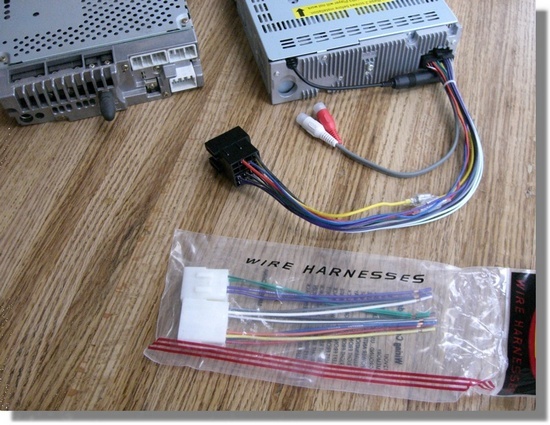 Below: Use a wire harness so you don’t have to cut wires under your dashboard. You buy a harness at eBay or from some other Internet retailer. Below: I used small screwdrivers to release the old radio from the dashboard, but you can use 6D nails or some other non-flexible steel that will fit in the holes. Below: Use a small screwdriver to gently remove the trim to expose the radio’s release holes. 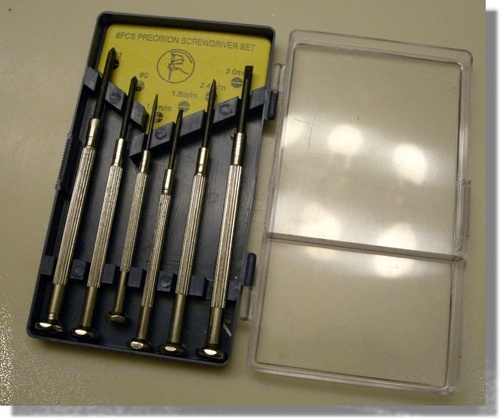 below: See how the screwdrivers release the catch that holds the radio in the dashboard? Below: With the screwdrivers in the hole, I pulled the radio out with my fingers. Below: My new radio was held in place with a standard sized metal sleeve. Just insert the sleeve and bend back the tabs. Next Using Dual LCD Monitors – up to 4 LCD monitors! Hi — what inexpensive radio did you buy ? Chuck: Hi Susan. I installed the Lazar VBD2900 MU in both my car and a truck I drive in the winter. great Info. It reallly helped with my new Radio. Thanks! Your instructions were very helpful. I have a question, I purchased a radio for a 1999 Miata and want to install it in a 1997 Miata, wondering before I start what problems may I incurr and solutions for them. Thank you. Mike C.
Chuck Eglinton’s Answer: Hi Mike. Unfortunately, I don’t know of any specific differences in the radio installations for those years. All the Miata radios I’ve seen are the same dimensions so the radio should fit. Also, all the Miata radio harnesses from 1990 to 2002 are the same, so you should be able to plug the wiring harness into the new radio after removing the old Miata radio. Good luck. I have an ’04 Mazdaspeed with the Bose with 6 CD changer. Following your instructions I have the radio loose but cannot pull it far enough out to get to the connectors. I’m afraid to pull any harder. Any ideas how to get to the connectors? My radio is about twice as high as the one in your pictures. I have to get the right amp out so I can replace it. 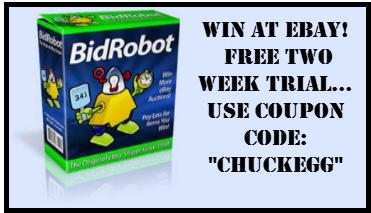 Chuck, I have a 2002 miata with a 6 cd changer bose factory installed stereo. The face plate is only lit up half the time making it difficult to see the time and station. Can you replace only the faceplate! Everything else works fine. If so, where might I find one? Can’t seem to find the stereo mounting sleeve you have in the picture anywhere online. I have a 1999 Mazda MX-5 Miata with stock radio (1-DIN). I wish to install a Pioneer DEH-P710BT aftermarket stereo, but the mounting holes aren’t similar to the stock Miata stereo. No luck online with any sort of compatible stereo installation mounting kit suitable for a 99 MIata. Help! The mounting sleeve in the photos was included with the radio I purchased. I can tell it is a sleeve because it has a bunch of triangular cut-outs that are meant to be pushed up after the sleeve is inserted into the dashboard. I have a Miata 97 M edition, the radio has barely any volume. I want to remove it but no one can tell me how. Radio is Mazda MPSS, Pioneer 6270 model. No information can be found to remove this one. I have a 2008 Mazda Miata. I would like to upgrade the speakers. I have a non-bose system. My research indicates I have a small set of 3.5 inch speakers in the rear. My door speakers are a woofer and a tweeter. I have tried to find out the sizes for the door. I have not pulled the door panel yet. Crutchfield, Autotoys.com, and Best Buy have all told me something totally different. I didn’t know if you had any info or could point me to a good resource. Thanks. wow, this is 8 yrs old. I don’t think I’ll get a response but I’ll give it a try. I have a 91, just bought a new radio for it. I bought the car used with an aftermarket radio in it. I can’t for the life of me figure out how to get the radio in and secure it. I see in the pic you installed the radio sleeve to slide the radio into but what did you secure the sleeve to? Am I to believe that the radio is being supported entirely by the provided sleeve? Hi. the sleeve is a couple inches deep. After sliding it in, use your fingers to bend perforated tabs to hold the sleeve in place.